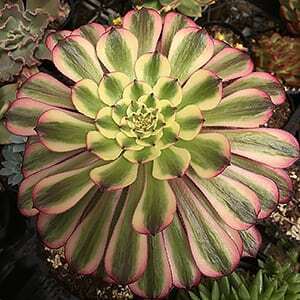 Aeonium are fascinating succulent, sub-tropical plants with rosette, waxy leaves originally from the Canary Islands. Ideal for containers on the deck or in the ground in hot, sunny positions a number of species and cultivars are availble for sale. Aeonium arboreum and the cultivar A. ‘Schwarzkopf’ are dark foliaged varieties, A. Schwarzkopf has wonderful deep purple leaves. A. arboreum is a larger sculptural species. A. Simsii is a small variety, 10cm. 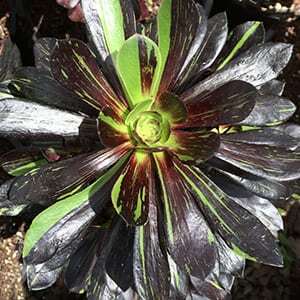 A. tabuliforme or ‘Dinner Plate Aeonium’ has a large green head of foliage. These plants are native to the Mediterranean, Canary Islands and Madeira and surrounding areas. A genus of about 40 species these succulents are really subtropical plants and are related to Sempervivum. Some varieties are tall growing, such as A. arboreum ‘Velour’ pictured right. Others are very low growing including A. tabuliforme. 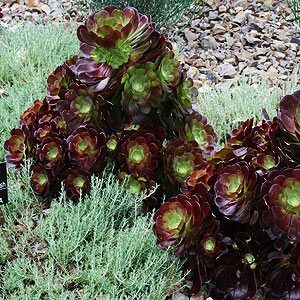 Aeoniums have rosettes of waxy leaves and are ideal for containers on the deck or in the ground in hot, sunny positions. Aeoniums need some shelter from frost. Many cultivars are also available including some amazing hybrids such as Aeonium ‘Big Bang’ and ‘Mardi Gras’. A. Schwarzkopf has wonderful deep purple leaves. A. Simsii is a small variety, 10cm. A. arboreum is a larger sculptural species. A. undulatum – With interesting wavy or ‘undulating’ foliage this is a large growing species. A. tabuliforme – An unusual low growing ‘flat’ species, interesting circular pattern in the foliage. 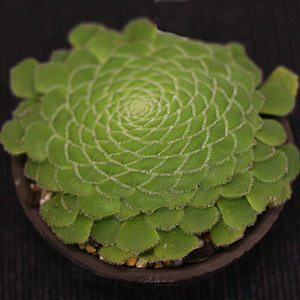 Growing conditions for Aeonium and Aeonium care. These are succulents originally from the Canary Islands and can endure long periods without water all species require shelter from frost. A sunny position and a well drained potting mix are essential, protection from frosts is needed. Aeoniums, like most succulents do require an excellent drainage system, watering can be carried out once a week during active growth periods. They will do well with an all purpose fertilizer applied once a month. They can endure long periods without water however should be watered after fertilising. Protect from frosts and extreme cold. Some varieties are stemless and some are tall growing, regular pruning of tall growing varieties will encourage branching. If plants become to tall or ‘leggy’ the top sections can be removed, allowed to dry for a week or two in a shaded but warm spot and then replanted.